James Knox Polk ( November 2, 1795– June 15, 1849) was the eleventh President of the United States, serving from March 4, 1845 to March 4, 1849. Polk was born in Mecklenburg County, North Carolina but mostly lived in and represented the state of Tennessee. A Democrat, Polk served as Speaker of the House (1835–1839) and governor of Tennessee (1839–1841) prior to becoming president. Polk was the first president who retired after one term and did not seek reelection. He is noted for his success in winning a war with Mexico and adding vast new territories. He lowered the tariff and established a treasury system that lasted until 1913. A " dark horse" in 1844, he fulfilled his promise to serve only one term, and died three months after his term ended. His single term in office is most notable for the largest expansion (in area) of the nation's boundaries (exceeding even the Louisiana Purchase), through the negotiated establishment of the Oregon Territory and the purchase of 1.2 million square miles through the Treaty of Guadalupe Hidalgo that ended the Mexican–American War. The expansionism, however, opened a furious debate over slavery in the new territories that was resolved by the Compromise of 1850. He signed the Walker Tariff that brought an era of near free trade to the country until 1861. He oversaw the opening of the U.S. Naval Academy, the Smithsonian, the Washington Monument, and the issuance of the first postage stamps in the United States. He was the first President of the United States ever to be photographed. Scholars have ranked him #10 to #12 on the list of greatest presidents for his ability to set an agenda and achieve all of it. Portrait of Polk before his presidency. Polk, the first of ten children, was born in what is now Pineville, North Carolina in Mecklenburg County in 1795. His father, Samuel Polk, was a slaveholder, farmer and surveyor of Scots-Irish descent, and related to Scottish nobility. His mother, Jane Polk (née Knox) was a descendant of the Scottish religious reformer John Knox. In 1806, the Polk family moved to Tennessee, settling near Duck River in what is now Maury County. The family grew prosperous, with Samuel Polk becoming one of the leading planters of the area. Polk later moved to Nashville, Tenn. at age 11. During his childhood, Polk suffered from poor health. In 1812, his father took him to Kentucky, where the famous surgeon Dr. Ephraim McDowell conducted an operation to remove urinary stones. The operation may have left him sterile. Polk did enjoy comparatively better health during the rest of his life. Polk was home schooled; his formal education began at the age of 18, when he studied at Zion Church near his home. He later attended a school in Murfreesboro, where he met his future wife, Sarah Childress. After less than three years of attending the school, Polk left Tennessee to enroll in the University of North Carolina at Chapel Hill. While there, he practiced his oratorical skills as a member of the Dialectic Society. He graduated in 1818 and returned to Nashville to study law under Felix Grundy. 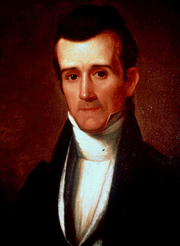 Polk was admitted to the bar in 1820, and established his own practice in Columbia, Tennessee. He worked with Aaron V. Brown who in the future would to be a Governor of Tennessee as well as Postmaster General. Polk was a slaveholder for almost his entire adult life. His father Samuel left title to over 8,000 acres (3,200 ha) of land and about 53 slaves to his widow and his children; James inherited control over nine of his father's slaves, either directly or from deceased brothers. In 1831, he became an absentee cotton planter, sending slaves to clear plantation land that his father had left him near Somerville, Tennessee. Three years later he sold his Sommerville plantation and bought 920 acres (370 ha) of land, together with his brother-in-law, for a cotton plantation near Coffeeville, Mississippi. He ran this plantation for the rest of his life, eventually taking it over completely from his brother-in-law. He infrequently bought more slaves and sold others, although once he became President and could better afford it, he bought more slaves. Polk's will stipulated that their slaves were to be manumitted after both he and his wife Sarah had died. The slaves, however, were freed by the Emancipation Proclamation before the death of his widow. Polk was brought up as a Jeffersonian Democrat, for his father and grandfather were strong supporters of Thomas Jefferson. The first public office he held was that of chief clerk of the Senate of Tennessee (1821–1823); he resigned the position in order to run his successful campaign for the state legislature. Polk's oratory became popular, earning him the nickname "Napoleon of the Stump." He courted Sarah Childress, and they married on January 1, 1824. Polk became a supporter of Andrew Jackson, then the leading politician of Tennessee. 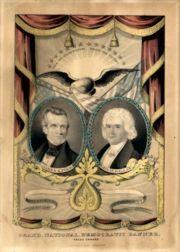 In 1824, Jackson ran for President, while Polk campaigned for the House of Representatives. Polk succeeded, but Jackson was defeated. Though Jackson had won the popular vote, neither he nor any of the other candidates ( John Quincy Adams, Henry Clay, and William H. Crawford) had obtained a majority of the electoral vote, allowing the House of Representatives to select the victor. In his first speech, Polk expressed his belief that the House's decision to choose Adams was a violation of the will of the people; he even proposed (unsuccessfully) that the Electoral College be abolished. In Congress, Polk was a firm supporter of Jacksonian democracy; he opposed the Second Bank of the United States, favored gold and silver over paper money; distrusted banks; and preferred agricultural interests over industrial ones. This behaviour earned him the nickname "Young Hickory," an allusion to Andrew Jackson's sobriquet, "Old Hickory." After Jackson defeated Adams in the presidential election of 1828, Polk rose in prominence, becoming the leader of the pro-Administration faction in Congress. As chairman of the powerful Ways and Means Committee, he lent his support to the President in the conflict over the National Bank. Later after Polk became speaker in 1835, Jackson left office, to be succeeded by fellow Democrat Martin Van Buren. Van Buren's term was a period of heated political rivalry between the Democrats and the Whigs, with the latter often subjecting Polk to insults, invectives, and challenges to duels. In 1838, the political situation in Tennessee—where, in 1835, Democrats had lost the governorship for the first time in their party's history—convinced Polk to return to help the party at home. 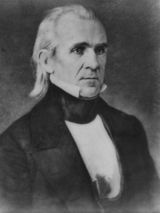 Leaving Congress in 1839, Polk became a candidate in the Tennessee gubernatorial election, defeating fellow Democrat Newton Cannon by about 2,500 votes. Though he revitalized Democrats in Tennessee, his victory could not put a stop to the political decline of the Democratic Party elsewhere in the nation. In the presidential election of 1840, Van Buren was overwhelmingly defeated by a popular Whig, William Henry Harrison. Polk lost his own gubernatorial re-election bid to a Whig, James C. Jones, in 1841. He challenged Jones in 1843 but was defeated once again. Presidential electoral votes by state. Polk initially hoped to be nominated for vice-president at the Democratic convention, which began on May 27, 1844. The leading contender for the presidential nomination was former President Martin Van Buren, who wanted to stop the expansion of slavery. Other candidates included General Lewis Cass (an expansionist) and James Buchanan (a moderate). The primary point of political contention involved the Republic of Texas, which, after declaring independence from Mexico in 1836, had asked to join the United States. Van Buren opposed the annexation but in doing so lost the support of many Democrats, including former President Andrew Jackson, who still had much influence. Van Buren won a simple majority on the convention's first ballot but did not attain the two-thirds supermajority required for nomination. After six more ballots, when it became clear that Van Buren would not win the required majority, Polk was put forth as a "dark horse" candidate. The eighth ballot was also indecisive, but on the ninth, the convention unanimously nominated Polk, who had Jackson's support. Despite having served as speaker of the House of Representatives, he was relatively unknown, leading many Whigs to snipe, "Who is James K. Polk?" When advised of his nomination, Polk replied: "It has been well observed that the office of President of the United States should neither be sought nor declined. I have never sought it, nor should I feel at liberty to decline it, if conferred upon me by the voluntary suffrages of my fellow citizens." Because the Democratic Party was splintered into bitter factions, Polk promised to serve only one term if elected, hoping that his disappointed rival Democrats would unite behind him with the knowledge that another candidate would be chosen in four years. Polk's Whig opponent in the 1844 presidential election was Henry Clay of Kentucky. (Incumbent Whig President John Tyler—a former Democrat—had become estranged from the Whigs and was not nominated for a second term.) The question of the annexation of Texas, which was at the forefront during the Democratic Convention, once again dominated the campaign. Polk was a strong proponent of immediate annexation, while Clay seemed more equivocal and vacillating. Another campaign issue, also relating to westward expansion, involved the Oregon Country, then under the joint occupation of the United States and Great Britain. The Democrats had championed the cause of expansion, informally linking the controversial Texas annexation issue with a claim to the entire Oregon Country, thus appealing to both Northern and Southern expansionists. (The slogan "Fifty-Four Forty or Fight", often incorrectly attributed to the 1844 election, did not appear until later; see Oregon boundary dispute.) Polk's consistent support for westward expansion—what Democrats would later call "Manifest Destiny"—likely played an important role in his victory, as opponent Henry Clay hedged his position. In the election, Polk won in the South and West, while Clay drew support in the Northeast. Polk lost his home state of Tennessee as well as North Carolina, his alma mater. However, Polk won the crucial state of New York, where Clay blamed supporters to the third-party candidate James G. Birney. 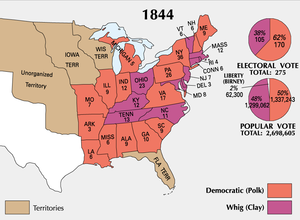 Polk won the popular vote by a margin of about 38,000 out of 2.6 million, and took the Electoral College with 170 votes to Clay's 105. Polk is still the only Speaker of the House of Representatives ever to be elected President. When he took office on March 4, 1845, Polk, at 48, became the youngest man to assume the presidency up to his time. According to a story told decades later by George Bancroft, Polk set four clearly defined goals for his administration: the re-establishment of the Independent Treasury System, the reduction of tariffs, acquisition of some or all the Oregon boundary dispute, and the purchase of California from Mexico. Resolved to serve only one term, he accomplished all these objectives in just four years. By linking new lands in Oregon (with no slavery) and Texas (with slavery) he hoped to satisfy both North and South. In 1846, Congress approved the Walker Tariff (named after Robert J. Walker, the Secretary of the Treasury), which represented a substantial reduction of the high Whig-backed Tariff of 1842. The new law abandoned ad valorem tariffs; instead, rates were made independent of the monetary value of the product. Polk's actions were popular in the South and West; however, they earned him the contempt of many protectionists in Pennsylvania. In 1846, Polk approved a law restoring the Independent Treasury System, under which government funds were held in the Treasury, rather than in banks or other financial institutions. Polk's views on slavery made his presidency bitterly controversial between proponents of slavery, opponents of slavery, and advocates of compromise, and the effect of his own career as a plantation slaveholder on his policymaking has been argued. During his presidency, many abolitionists harshly criticized him as an instrument of the " Slave Power," and claimed that the expansion of slavery lay behind his support for the annexation of Texas and later war with Mexico. Polk stated in his diary that he believed slavery could not exist in the territories won from Mexico, but refused to endorse the Wilmot Proviso that would forbid it there. Polk argued instead for extending the Missouri Compromise line to the Pacific Ocean, which would prohibit the expansion of slavery above 36° 30' west of Missouri, but allow it below that line if approved by eligible voters in the territory. Polk was committed to expansion—Democrats believed that opening up more farms for yeoman farmers was critical for the success of republican virtue. (See Manifest Destiny.) To balance the interests of North and South he sought the Oregon territory (comprising present-day Oregon, Washington, Idaho, and British Columbia), as well as Texas. He sought to purchase California, which Mexico had neglected. President Tyler had interpreted Polk's victory as a mandate for the annexation of Texas. Acting quickly because he feared British designs on Texas, Tyler urged Congress to pass a joint resolution admitting Texas to the Union; Congress complied on February 28, 1845. Texas promptly accepted the offer and officially became a state on December 29, 1845. The annexation angered Mexico, however, which had succumbed to heavy British pressure and had offered Texas its semi-independence on the condition that it should not attach itself to any other nation. Mexican politicians had repeatedly warned that annexation meant war. The Oregon Territory, established by the Oregon Treaty. Polk put heavy pressure on Britain to resolve the Oregon boundary dispute. Since 1818, the territory had been under the joint occupation and control of Great Britain and the United States. Previous U.S. administrations had offered to divide the region along the 49th parallel, which was not acceptable to the British, who had commercial interests along the Columbia River. Although the Democratic platform had asserted a claim to the entire region, Polk was prepared to quietly compromise. When the British again refused to accept the 49th parallel boundary proposal, Polk broke off negotiations and returned to the "All Oregon" position of the Democratic platform, which escalated tensions along the border. Expansionists after the 1844 election shouted "Fifty-Four Forty or Fight!" This slogan, often associated with Polk, was in fact the position of his rivals in the Democratic Party, who wanted Polk to be as uncompromising in acquiring the Oregon territory as he had been in annexing Texas. Polk wanted territory, not war, and compromised with the British Foreign Secretary, Lord Aberdeen. The Oregon Treaty of 1846 divided the Oregon Country along the 49th parallel, the original American proposal. Although there were many who still clamored for the whole of the territory, the treaty was approved by the Senate. 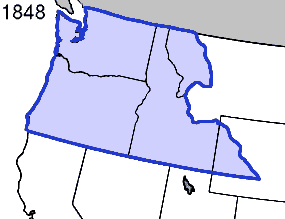 The portion of Oregon territory acquired by the United States would later form the states of Washington, Oregon, and Idaho, and parts of the states of Montana and Wyoming. After the Texas annexation, Polk turned his attention to California, hoping to acquire the territory from Mexico before any European nation did so. The main interest was San Francisco Bay as an access point for trade with Asia. In 1845, he sent diplomat John Slidell to Mexico to purchase California and New Mexico for $30 million. Slidell's arrival caused political turmoil in Mexico after word leaked out that he was there to purchase additional territory and not to offer compensation for the loss of Texas. The Mexicans refused to receive Slidell, citing a technical problem with his credentials. Meanwhile, to increase pressure on Mexico to negotiate, in January 1846 Polk sent troops under General Zachary Taylor into the area between the Nueces River and the Rio Grande—territory that was claimed by both the U.S. and Mexico. Slidell returned to Washington in May 1846, having been rebuffed by the Mexican government. Polk regarded this treatment of his diplomat as an insult and an "ample cause of war", and he prepared to ask Congress for a declaration of war. Serendipitously, mere days before he intended to make his request to Congress, Polk received word that Mexican forces had crossed the Rio Grande area and killed eleven American troops. Polk now made this the casus belli, and in a message to Congress on May 11, 1846, he stated that Mexico had "invaded our territory and shed American blood upon the American soil." He did not point out that the territory in question was disputed and did not unequivocally belong to the United States. Several congressmen, including a young Abraham Lincoln, expressed doubts about Polk's version of events, but Congress overwhelmingly approved the declaration of war, with many Whigs fearing that opposition would cost them politically. In the House, anti-slavery Whigs led by John Quincy Adams voted against the war; among Democrats, Senator John C. Calhoun was the most notable opponent of the declaration. 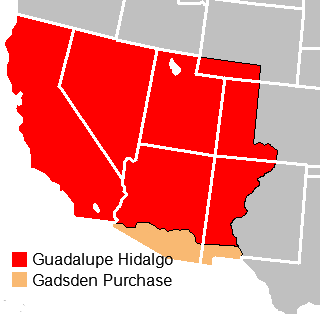 The Mexican Cession (in red), acquired through the Treaty of Guadalupe Hidalgo. The Gadsden Purchase (in yellow) acquired through purchase. By the summer of 1846, New Mexico had been conquered by American forces under General Stephen W. Kearny. Meanwhile, Army captain John C. Frémont led settlers in northern California to overthrow the small Mexican garrison in Sonoma. General Zachary Taylor, at the same time, was having success on the Rio Grande. The United States also negotiated a secret arrangement with Antonio López de Santa Anna, the Mexican general and dictator who had been overthrown in 1844. Santa Anna agreed that, if given safe passage into Mexico, he would attempt to persuade those in power to sell California and New Mexico to the United States. Once he reached Mexico, however, he reneged on his agreement, declared himself President, and tried to drive the American invaders back. Santa Anna's efforts, however, were in vain, as generals Zachary Taylor and Winfield Scott destroyed all resistance. Polk sent diplomat Nicholas Trist to negotiate with the Mexicans. Lack of progress prompted the President to order Trist to return to the United States, but the diplomat ignored the instructions and stayed in Mexico to continue bargaining. Trist successfully negotiated the Treaty of Guadalupe Hidalgo in 1848, which Polk agreed to ratify, ignoring calls from Democrats who demanded the annexation of the whole of Mexico. The treaty added 1.2 million square miles (3.1 million square kilometers) of territory to the United States; Mexico's size was halved, whilst that of the United States increased by a third. California, New Mexico, Arizona, Nevada, Utah, and parts of Colorado and Wyoming were all included in the Mexican Cession. The treaty also recognized the annexation of Texas (and so the Mexican Cession includes the land annexed) and acknowledged American control over the disputed territory between the Nueces River and the Rio Grande. Mexico, in turn, received the sum of $15 million. The war involved less than 20,000 American casualties but over 50,000 Mexican casualties. It had cost the United States nearly $100 million. Congressman Abraham Lincoln challenged the factual claims made by President Polk about the boundary, claiming it was indeterminant and should not have been a cause of war. In January 1848, the Whigs won a House vote attacking Polk in an amendment to a resolution praising Major General Taylor for his service in a "war unnecessarily and unconstitutionally begun by the President of the United States". . The resolution, however, died in committee. The Whigs who had been so opposed to Polk's policy in January 1848 suddenly changed position in the summer. Two-thirds of the Whigs in the Senate voted for Polk's treaty that ended the war and acquired vast new lands (most of New Mexico, Arizona and California). Later in 1848, the Whigs nominated Zachary Taylor, the hero of the war, for president. Taylor said there would be no future wars, but he refused to criticize Polk, who kept his promise not to run for reelection. The Whigs therefore dropped their criticism of the war and won the election. Meanwhile the Wilmot Proviso injected the issue of slavery in the new territories, which Polk insisted during the war both to other congressmen and in his diary had never been a war goal. In the summer of 1848, President Polk authorized his ambassador to Spain, Romulus Mitchell Saunders, to negotiate the purchase of Cuba and offer Spain up to $100 million. Cuba was close to the United States and had slavery, so the idea appealed to Southerners but was unwelcome in the North. The Spanish government rejected Saunders' overtures. James K. Polk's tomb lies on the grounds of the state capitol in Nashville, Tennessee. Polk's considerable political accomplishments took their toll on his health. Full of enthusiasm and vigor when he entered office, Polk left the White House on March 4, 1849, exhausted by his years of public service. He lost weight and had deep lines and dark circles on his face. He is believed to have contracted cholera in New Orleans, Louisiana on a goodwill tour of the South. He died at his new home, Polk Place, in Nashville, Tennessee, at 3:15 p.m. on June 15, 1849. Polk's devotion to his wife is illustrated by his last words: "I love you, Sarah. For all eternity, I love you." She lived at Polk Place for over forty years after his passing, a retirement longer than that of any other First Lady of the United States. She died on August 14, 1891. Polk had the shortest retirement of all Presidents who did not die in office, at 103 days. He was also the youngest former president to die in retirement at the age of 53. 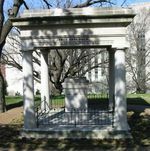 He and his wife are buried in a tomb on the grounds of the Tennessee State Capitol Building, in Nashville. Polk's primary legacy is the huge amount of territory acquired by the United States during his administration. His name is also associated with Manifest Destiny—the idea that it was the United States' mission to expand westward. Polk was the first president after James Monroe to significantly apply the Monroe Doctrine, which asserted that the Americas should be free from European colonization or other interference. Polk is sometimes regarded as the first effective wartime president, conducting the Mexican War more capably than James Madison had done in the War of 1812. Political partisanship was intense during Polk's administration, however, and he was not liked by Whigs. He has fared better with historical hindsight, and in surveys many historians rate Polk as a near-great president. In these surveys, Polk is usually the highest ranked president who served only one full term, and the highest ranked in the era between Andrew Jackson and Abraham Lincoln. Polk's role in the outbreak of the Mexican-American War has been the subject of both support and criticism. Many historians argue that Mexico was wrong in going to war with the United States for no real reason and against the strong advice of its only allies, Britain and France. Other historians say Polk deliberately provoked a needless war; others suggest that he pursued a policy of brinkmanship which worked regarding Britain but spiraled out of control regarding Mexico. The issue of Texas annexation was decided by the election, but abolitionist arguments that it was a slaveocracy plot fueled the growing mistrust between North and South. Several United States counties are named after Polk. These include Polk County, Arkansas, 1844; Polk County, Iowa; Polk County, Oregon, 1845; Polk County, Georgia, 1851; Polk County, Florida, 1861; Polk County, Nebraska, 1870; and Polk County, Missouri, 1835, which was originally named in honour of Polk's grandfather, Revolutionary War hero Ezekiel Polk. When the Missouri legislature acted to create the county, they chose to honour James K. Polk, then Speaker of the House. Polk County, North Carolina is not named after James K. Polk. They Might Be Giants' song "James K. Polk" chronicles his political career from the 1844 nomination to his retirement.